With native Oracle auditing, you have to spend time collecting all audit records from each database and analyzing them to understand who made what change and where. 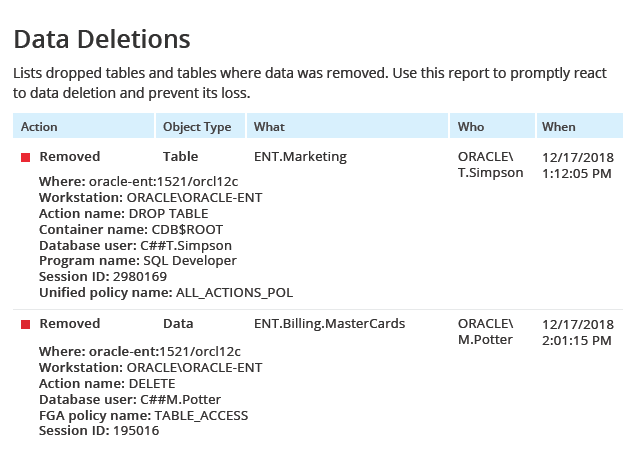 Netwrix Auditor provides actionable information about each critical event, such as table deletions and system role modifications, so you can quickly spot and revert unwanted changes and safeguard your sensitive data. 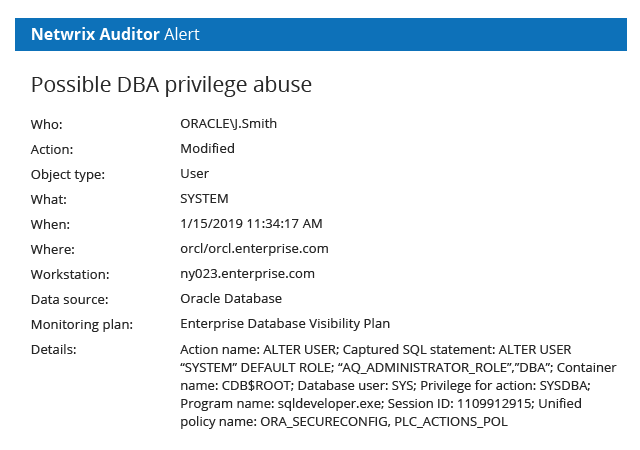 It is easy to get overwhelmed if you have to read through all Oracle audit entries when trying to validate access controls in your organization. 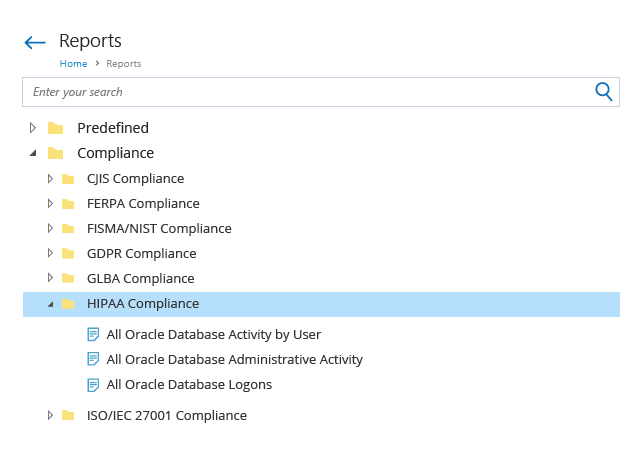 Netwrix Auditor’s easy-to-read reports simplify monitoring of successful and failed attempts to log on to Oracle Database, as well as data access attempts, so you can quickly spot an attacker trying to break into your system or someone attempting to access sensitive data without authorization. To ensure the security of business-critical and regulated data, you need to know exactly what kinds of sensitive data are stored in your databases and whether that data is properly secured. 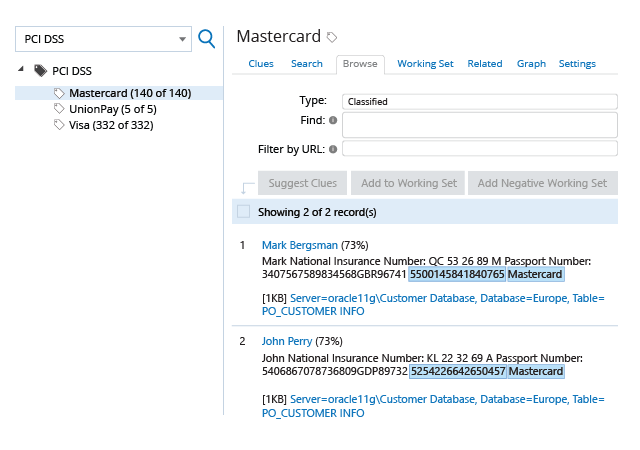 Using Netwrix Auditor Data Discovery and Classification Edition, you’ll be able to find sensitive data across your databases to ensure that no critical data is stored outside of a secure location. If you have to manually pore through cryptic audit trails, you’re likely to miss security issues until they turn into full-blown incidents. 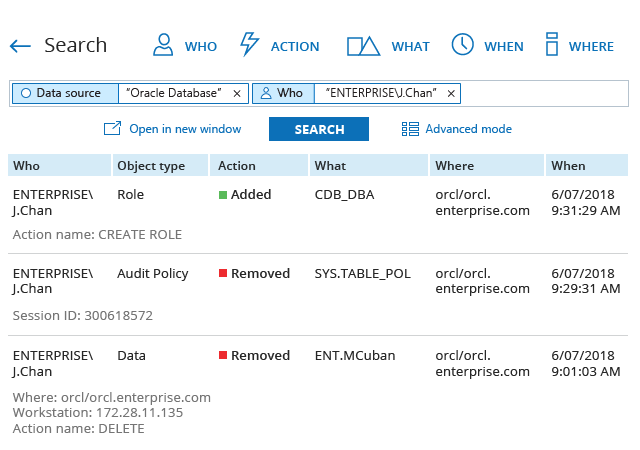 Netwrix Auditor notifies you about the events you deem most critical, such as changes to system privileges and roles, so you can streamline privilege auditing and quickly detect suspicious DBA or user behavior. Using the details provided in the alerts, you’ll be able to respond to incidents in time to avoid data breaches and other damage. 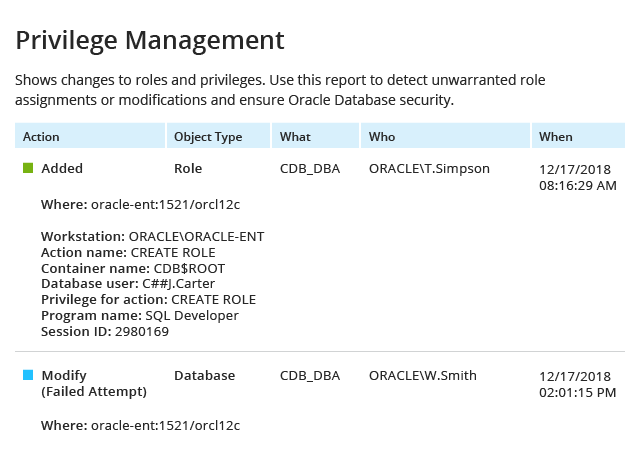 Even though you can configure basic alerts within your Oracle infrastructure, you are likely to miss a sequence of suspicious database activity that’s been going for a while. 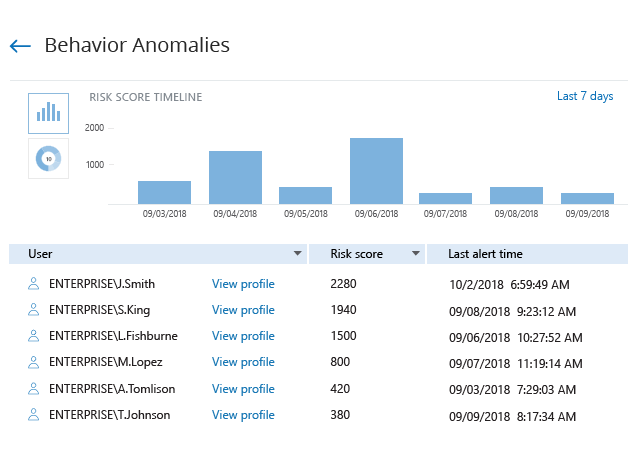 Netwrix Auditor provides a single view of all anomalous activity alerts triggered by an individual across all audited systems, along with the cumulative risk score, to improve detection of threat actors and help you make more informed remediation decisions. To harden Oracle Database Server security, it's crucial to set default object audit options and audit SQL statements across your Oracle databases, and also stay current on suspicious user activity, such as a DBA being active outside business hours or making multiple failed logon attempts to the production database. Continuously monitor Netwrix Auditor’s user behavior and blind spot analysis reports to quickly identify these subtle indicators of threats and investigate what’s happening before damage is done. If you spot malicious activity, such as a system account calling EXECUTE PROCEDURE statements to the main database or modifying its data dictionary, you can’t afford to waste time examining endless native audit logs to figure out how it happened. Interactive Search enables you to quickly sort through your audit data and find the answers you need in a few clicks. 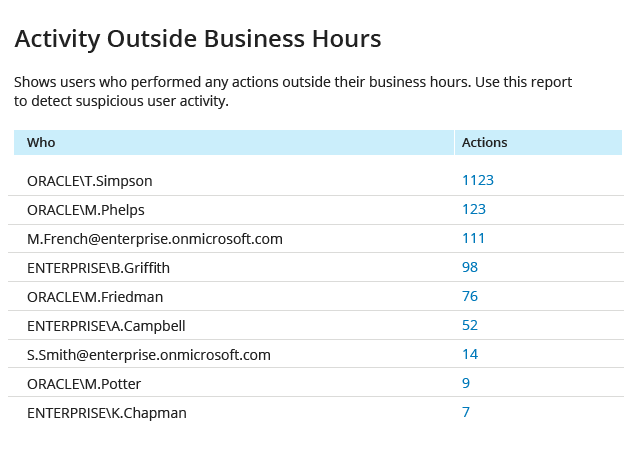 You can even use your query to easily create custom reports tailored to your specific needs and stay updated on similar incidents in the future. To spot unusual spikes in user activity, you need to review consolidated statistics on activity across your databases. 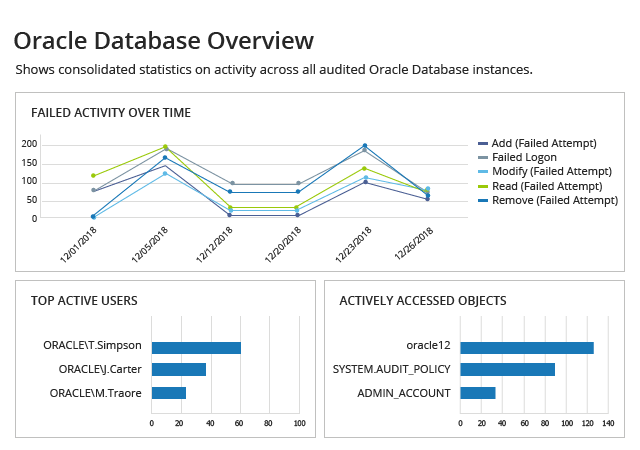 Netwrix Auditor’s overview dashboard helps you quickly find the dates when the most failed activity happened, the users who have made the most changes, and the most frequently accessed databases and other objects. For example, if a DBA repeatedly tried to insert, update, delete or alter data across your databases, you can quickly spot that DBA’s name at the top of the risky users list and provide your best response. Even if you audit all sessions across databases and maintain an Oracle Database audit trail, you might still face challenges when trying to prove your compliance to auditors. With Netwrix Auditor, you can easily demonstrate your compliance using out-of-the-box compliance reports mapped to specific controls of PCI DSS, HIPAA, GDPR, SOX, GLBA, FISMA/NIST and other regulatory standards, so you can pass compliance audits faster and with less effort. Want to enable auditing of all systems and applications your organization relies on in one place and automate internal business processes and IT workflows? It’s easy to integrate Netwrix Auditor with your IT ecosystem using its RESTful API. The Add-on Store offers free add-ons for most common applications, including SIEM solutions. Responding manually to day-to-day incidents and anticipated threats requires lots of time and can distract you from your primary duties. Netwrix Auditor enables you automate your response to each type of incident by having alerts trigger custom scripts, so you can save your valuable time and concentrate on the tasks that really matter. The default auditing retention period for Oracle Database is just 90 days. To comply with various regulatory standards, you must not only generate audit records but also retain them for a far longer time. Netwrix Auditor securely stores your audit trail in a two-tiered (file-based + SQL database) storage for more than 10 years while ensuring quick and easy access to it. Whenever a new DBA is hired in your organization, you need to ensure they have a proper access to Netwrix Auditor’s security intelligence. By granularly assigning the appropriate access rights to everyone who needs them, you can be confident that only authorized personnel can view security reports and configure auditing settings. 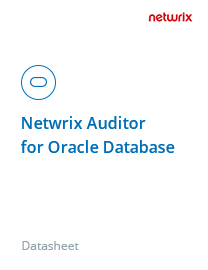 Learn how Netwrix Auditor for Oracle Database can help you streamline Oracle Database audits, detect data threats and pass compliance checks with less effort. Get a convenient list of the functionality of Netwrix Auditor for Oracle Database in a fill-in-the-blank format that simplifies comparing it with tools from other vendors.